Wik-E-Mart, known alternatively as Simpsons Merchandise Wiki, was a wiki that consisted of information on The Simpsons-branded merchandise and retailers. 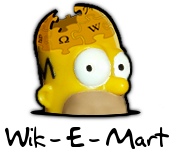 After much debate, the Simpsons Merchandise Wiki was made on September 18, 2011. The name was soon changed to "Wik-E-Mart" (suggested by Supergeeky1). Within the following weeks, users began to move articles pertaining to merchandise, from Wikisimpsons to Wik-E-Mart. In January 2012, it was decided that the merchandise wiki articles be moved back to the main wiki, due to the fact that the wiki did not get many visitors. Modified on March 16, 2014, at 06:39.